A year ago, Noah Vedral was still trying to gain his bearings after transferring back home from Central Florida. When Scott Frost left Orlando to take the Nebraska job, the Wahoo Neumann graduate — who won the back-up quarterback job behind McKenzie Milton as a true freshman — followed him to Lincoln. Vedral knew the offense better than anyone at Nebraska outside of the coaching staff, and anticipating a redshirt season, Vedral moved into more of a coach on the field than an active player, ceding practice reps to other quarterbacks. 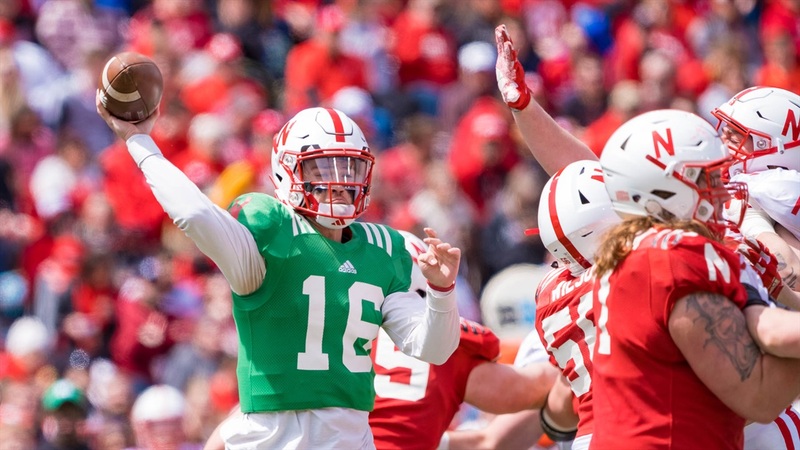 In last year’s spring game, three months after Vedral transferred back to Lincoln, Vedral played for the White team (made up primarily of third- and fourth-teamers) and struggled, finishing 7-of-13 passing for 53 yards and an interception. He carried the ball five times for minus-9 yards including three sacks. After going back and forth about applying for a waiver for first-year eligibility, Nebraska finally went through it after Adrian Martinez got injured. Vedral’s waiver was granted ahead of Nebraska’s game at Northwestern on Oct. 13, the sixth game of the season. Suddenly he had to flip the switch from getting others ready to play to getting himself. He appeared in one game last season — against Bethune-Cookman on Oct. 27 — and struggled in that one as well, completing just two of his nine passes for 29 yards and a pick. Under the new rules, he maintained his redshirt and entered this season battling it out with Andrew Bunch for the back-up job behind Martinez. At this year’s spring game, Vedral looked a lot more like the guy who went 22-of-29 for 276 yards and a score in relief of Milton on 2017. He got to play on the Red team surrounded by first- and second-team guys and flourished, finishing 13-of-19 for 144 yards with two carries for 17 yards. He did have one interception, but it came when a ball got knocked out of a receiver’s hands and ricocheted off the defenders helmet into another defender’s hands. Vedral led two scoring drives, one for a touchdown and one for a field goal. The Red team won 24-13. Vedral was on time and on target with his passes for the most part, finding seven different receivers including a couple running backs, a couple tight ends and a few receivers for his 13 completions. He hit teammates for gains of 17, 20 and 24 yards while putting in about a quarter-and-a-half of work before handing the ball off to true freshman Luke McCaffrey to finish the game. He also showed off the wheels with a 15-yard run. Walk-on Andrew Bunch, who played well with the Red team in last year’s Spring Game and served as the primary back-up prior to Vedral becoming eligible, struggled with the White team on Saturday. He finished 9-of-21 for 80 yards, picking up 12 yards on one run but getting sacked three times for a loss of 18 yards. Vedral made a strong case for himself in the battle for the back-up quarterback job, but in the coaches’ eyes, Saturday’s game was just one of 15 practices this spring. Bunch entered his name into the transfer portal but ultimately decided to remain at Nebraska and battle with Vedral and McCaffrey for the back-up job. No matter who ultimately wins the job, the Huskers have some real experience sitting behind Martinez. But Saturday was a coming-out party of sorts for Vedral. After a couple of rough outings to begin his career as a Husker, the Nebraska native got the chance to show friends, family and nearly 86,000 fans what he is truly capable.